Everybody loves chicken breast. It’s lean and ready to cook straight out of the package. The problem is that it’s expensive per pound. To add to that, standard chicken breasts are getting pretty big, so it’s hard to buy a small amount. So why not try boneless, skinless chicken thighs? They’re a little more work to prepare for cooking (you have some more fat to trim compared to breasts), but they’re still healthy and just as delicious as (and arguably even better than) chicken breasts. So how much will you save swapping one pound of boneless chicken breast for one pound of chicken thighs? Throwing a bag of prepopped popcorn or a box of microwavable packets in your shopping cart is pretty easy. So easy that most people have forgotten how easy it is to make popcorn at home from just a jar of kernels. And as it turns out, it’s cheaper too. Another advantage of popping your own popcorn? You can control the additives. No need for imitation butter flavor when you can add a little of the real stuff or your own custom toppings to your freshly popped, piping-hot bag of popcorn. Frozen vegetables are underrated. They come prechopped and ready to use, are just as good for you as fresh vegetables and in some cases are considerably cheaper than their fresh counterparts. The real budget goldmine lies in the bags of frozen mixed vegetables. Instead of buying two bell peppers and an onion for your next stir-fry, for example, grab a bag of pepper and onion mix and use that instead. You’ll save time chopping and save some money too. Many shoppers have grown accustomed to eating whatever fruit or vegetable they want to year-round, regardless of whether it’s in season. This probably isn’t a good thing for quality reasons (in-season produce always seems to taste better, for one thing) and it certainly isn’t good for your budget. 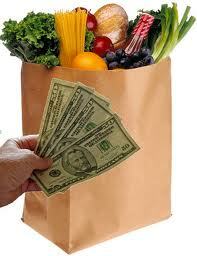 Eating in season is less costly. Take strawberries, for example. They’re a great source of vitamin C, but a pint of strawberries in the winter will set you back $3.50 or more. A large navel orange, on the other hand, is another great source of vitamin C and that will cost you only about 75 cents. Buying organic produce is great when you can afford it, but if you’re on a budget you’ll do better to stick with conventional. If you are concerned about pesticides, be strategic and choose the fruits and vegetables that have been shown to have very little pesticide residues according to the Environmental Working Group’s Shopper’s Guide to Pesticides in Produce. You can save anywhere from 30 cents to $1 (or more) by buying conventional over organic, depending on what you’re buying. Canned beans aren’t very expensive, but dry beans are almost free. Almost. Consider this: 1½ cups of dry beans costs only 34 cents and, once cooked, yields approximately the amount in two 15-ounce cans. Of course, you would never cook just 1/2 cup of beans, but if you buy them in bulk and cook a larger amount (on the stove or in your slow cooker), you can freeze what you don’t need right away in small portions or one large portion, depending on your future use. Then the next time you need to cook with beans, you can just reach into your freezer instead of reaching for a can.